( above photo;. Templemore Golf Club Autumn League Winners; Seanie Gleeson, John Hassett, Club Captain Tony O’Toole, Seamus Bourke, Ann O’Rourke. (Photo by; Seamus Bourke). Bereavement; Sincere sympathy from all club members is extended to Myles Mc Morrow on the passing of his wife Helen on Monday 24th. December. Sympathy is also extended to his Mother-in-law, Mary, Sister-in-law Geraldine, Nieces, Ciara and Aoife, Cousins, Relatives and Friends. May Helen rest in peace. Open Competition; The weekly 11hole open competition started on Monday 25th. to Sunday 30th. There is great interest in this weekly open competition and from the support and comments it will be welcomed to continue. The course is playing long but in great condition considering the inclement weather. This is an ideal opportunity for all outside club members to avail of this OPEN COMPETITION. The results will be in the next issue. Presentations Prize Night; The successful 9Hole League results and other prize presentations were held on Saturday 22nd. in the Club Lounge. There was a great turnout. Competition Secretary Liam Leahy assisted by communication officer Martin Bohan congratulated all the prize winners. The club Captain Tony O’Toole presented the prizes and proud to present Paddy Bourke with the Vice Captains prize 2018. The results were as follows; League Team; 1st. 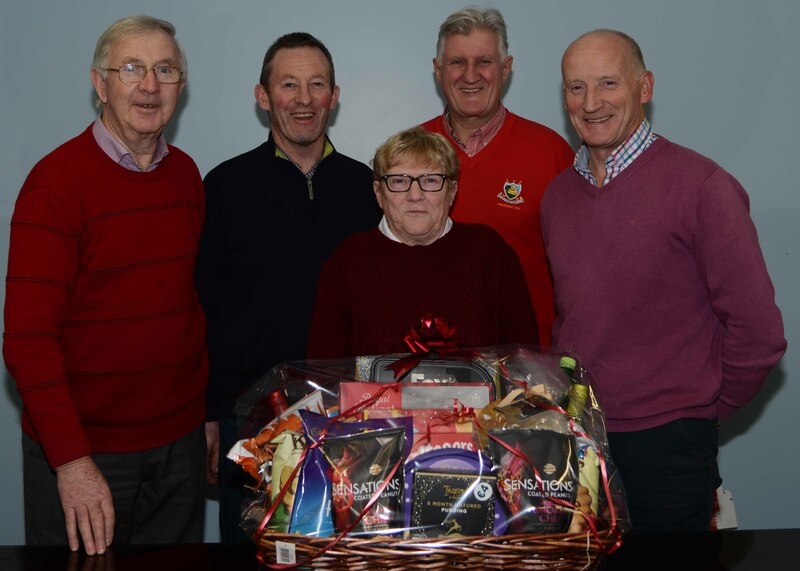 Prize, a very large Xmas hamper selection was presented to each first winner; Ann O’Rourke, Seanie Gleeson, John Hassett, Seamus Bourke. 2nd. Sadie Tynann, Timmy Touhy, Paddy Bourke, Sean Lee. Intermediate Scratch Cup; Declan Russell. Junior Scratch Cup; John Hassett. Golfer of the Year; Paddy Bourke. McHugh Cups; Sara Hearne, Dinny Touhy. Congratulations to all. 2019 Membership; The rates for 2019 will be the same as they were in 2018. New members are now been accepted. The membership categories have been increased to suit all sectors of the community. All current members are encouraged to introduce at least “ONE NEW MEMBER” Lady or Gent, Junior or Student, Seniors Juveniles and Family, Active Retiree’s, Special Needs or any person interested in taking up the sport. It will be a huge advantage to building the club membership and profile. Registrations Forms for new members are now available on-line on our web site, just select the “Membership” tab and it will give you the option to pay by Pay Pal or Credit Card. or collect an application form at the club house or contact Martin Bohan 087 0509278 or any of the committee members. Payment options can be made through the Golf Club web site link; http://templemoregolfclub.ie/membership/ All will be welcomed. Golf Vouchers; The Ideal Golf Gift is a membership Voucher. contact Martin Bohan 087 0509278 or any of the committee for to purchase the ideal Golf present. Private Donations for 2019; All private donations will be greatly received; Just select the “Membership” tab and then select “Make a Donation” tab. The Club will very much appreciate any donations that will help towards the purchase of new equipment, or in confidence contact; Martin Bohan 087 0509278. Ladies Golf; Best of luck to Lorraine Ryan as the new lady captain for 2019 and Mary Hogan as the new Lady President and to all the officers for 2019; Competition Secretary, Josie Moloney , Secretary, Kay Brennan, Handicap Secretary, Josie Bourke, Treasurer, Breda Murphy, Committee members; Ann Kenny, Bernie Stapleton and Maura Sheehan. We wish everyone happy golfing for 2019. The Seniors; On Thursday 20th. Dec. As always there was a great turn out and the course played well due to the excellent course condition ; The team results were; 1st.Team were; Liam Daly, John Brown, Mick Carey, Pat Ryan. 2nd.Team were; Ambrose Purcell, Joe. Hennessy, John Galvin. 3rd. Team were; Seamus Bourke, Ollie Murrey, Tony O’toole. On Thursday 27th. Dec. Shaking off the Xmas pudding was a great turn out. The winning teams were; 1st.Team were; Seamus Bourke, John Brown, Tony O’Toole. 2nd.Team were; Tom McGrath, Jim Gleeson, Frankie Shortt. 3rd. Team were; Liam Daly, Ollie Murry, Mick Murphy. Next Seniors; Thursday; 3rd. Jan.
2019 Golf Rules updates; Are now available in the locker room. It is recommended that all members take time to study the new rules. You can also download a visual App to your phone from www.randa.org/Apps This visual App will show you a picture of the course and where the changes apply. A must to have in your pocket when required. 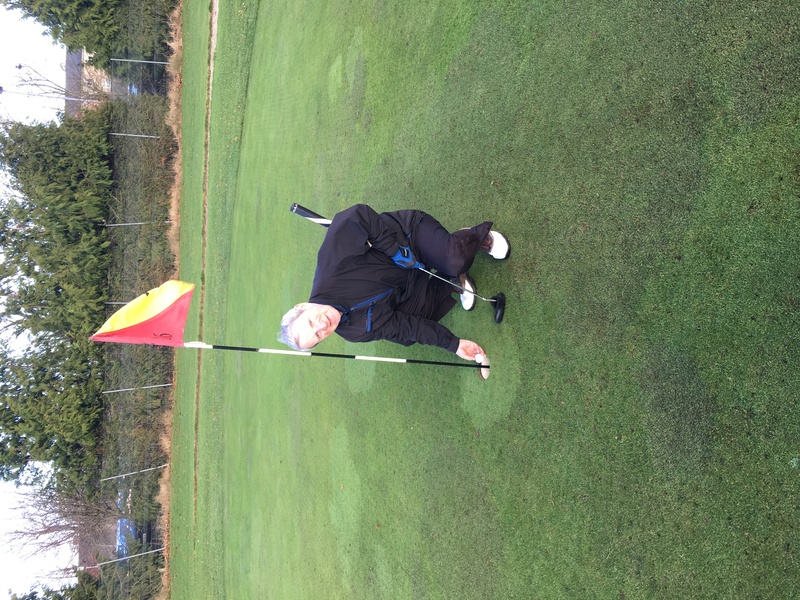 11hole Single Open from Monday 24th. to Sunday 30th. 3 Euro, Visitors 5 Euro. Course is in great condition for after Xmas Golf. Autumn League Presentations; The 9Hole League is now complete. The final results and prize presentations was held on Saturday 22nd. in the Club Lounge, the results will be in the next issue. 2019 fixtures will be announced soon. Captains Christmas Greetings; Club Captain Tony O’Toole wishes a very peaceful, healthy, enjoyable and safe Christmas to all members both ladies and gents and to all past members and look forward to a fantastic 2019 of Golf. Autumn League prize Presentations; The 9Hole League is now in the closing stages with some great scoring and with the introduction of wild cards the contest is in favour of all. The final result and prize presentations will be on Saturday 22nd. at 5pm in the Club Lounge to mark the end of a very successful competition and with the course in such great condition, all who took part are to be complemented. Competition Secretary Liam Leahy expressed to all to attend the presentation. 2019 Membership Fees; The fees for 2019 will be the same as they were in 2018. New members are now been accepted. The membership categories have been increased to suit all sectors of the community. All current members are encouraged to introduce at least “ONE NEW MEMBER” Lady or Gent, Junior or Student, Seniors Juveniles and Family, Active Retiree’s, Disability or any person interested in taking up the sport. It will be a huge advantage to building the club membership and profile. Registrations Forms for new members are now available on-line on our web site, just select the “Membership” tab and it will give you the option to pay by Pay Pal or Credit Card. or collect an application form at the club house or contact Martin Bohan 087 0509278 or any of the committee members. 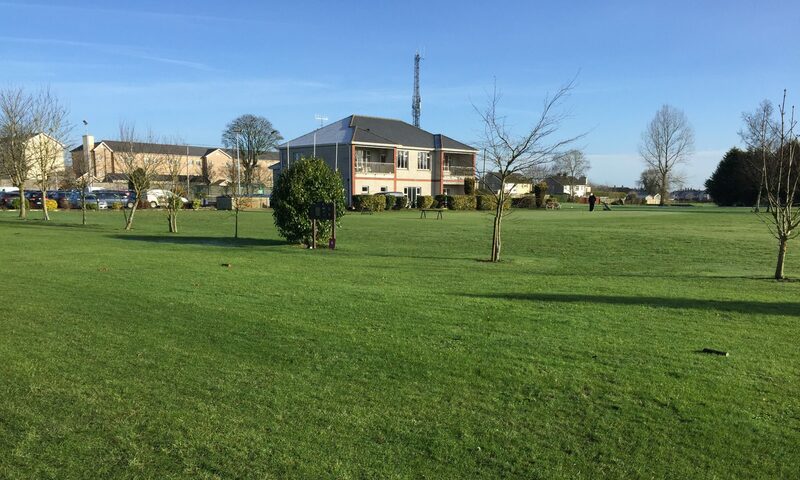 All payment options can be made through the Golf Club web site link; http://templemoregolfclub.ie/membership/ All will be welcomed. Ideal Xmas Gift Reminder; The Ideal Golf Gift is a membership Voucher. Go online and select the “Membership” tab and then select the “voucher” tab or contact Martin Bohan 087 0509278 or any of the committee for to purchase the ideal Xmas Golf present. Private Donations; All private donations will be greatly received; Just select the “Membership” tab and then select “Donations:” tab. The Club will very much appreciate any donations that will help towards the purchase of new equipment, in confidence contact; Martin Bohan 087 0509278. Ladies Golf; The AGM of the Ladies branch of Templemore golf club took place on Wednesday Dec 12th. Sara Hearne outgoing lady captain introduced Lorraine Ryan as the new lady captain for 2019.and outgoing lady president Bernie introduced Mary Hogan as our new Lady President. The officers for 2019 were then elected; Competition Secretary, Josie Moloney , Secretary, Kay Brennan, Handicap Secretary, Josie Bourke, Treasurer, Breda Murphy, Committee members Ann Kenny, Bernie Stapleton and Maura Sheehan. We wish Lorraine and Mary the very best for 2019. Presentation of prizes followed the AGM. We wish everyone a very happy Christmas and best wishes and happy golfing for 2019. The Seniors; On Thursday 13th. Dec. There was a great turn out due to the excellent course condition ; The team results were; 1st.Team with 52pts. were; Seamus Bourke, James Murray, Tom Kennedy, Ollie Murray. 2nd.Team with 48pts. were; John Hassett, Pat O’Connell, Shay O’ Connell, Frankie Shortt. 3rd. Team with 48pts. Mick Russell, John Galvin, Tom Hogan, Mick Carey. Next Seniors on Thursday 20th. Dec. Seniors AGM; A full house attended the AGM. All were thanked by PJ Leahy. 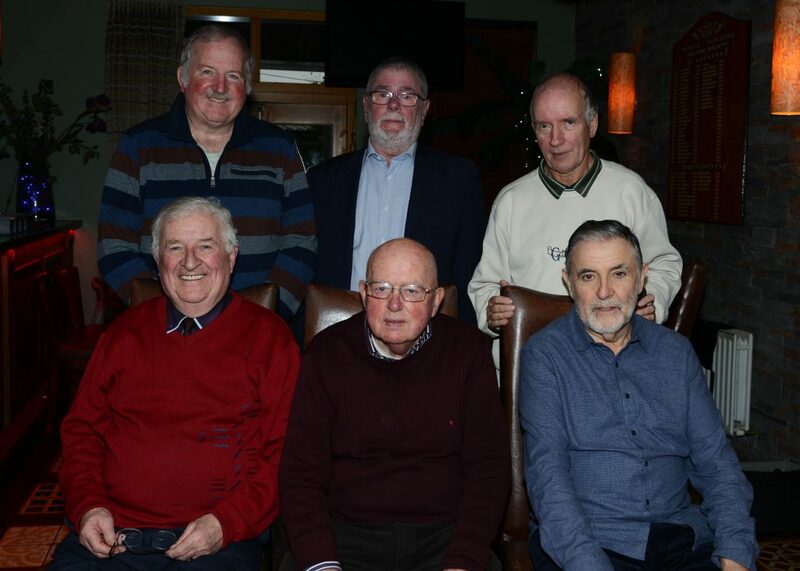 The following officers and committee for 2019 were elected; Chairman; PJ Leahy, Secretary, Pat O’Connell, Treasurer, Phil Ryan. Committee; John Galvin, Sean Lee, Rody Cawley and John Stapleton. Seniors Xmas Party; Was a special Day; with morning golf as usual at 10am. followed with Dinner in Murphy’s pub and presentation of all Xmas prizes. A great turn-out for all the seniors and a great delight by all to see the return of Rody Cawley to the table. 2019 Golf Rules; Club Captain Tony O’Toole and committee member Michael Purcell attended the Munster Branch “New Rules” seminar in Castletroy. It was professionally delivered by Mary Coman, Thurles and Kevin Glynn, Lahinch. It was very informative, there will be no doubt that the new rules and new technologies definitions will play a significant part in competitions going forward in 2019. It is recommended that all members take time to study the new rules. Booklets are available in the locker room. You can also download a visual App to your phone from www.randa.org/Apps This visual App will show you a picture of the course and where the changes apply. A must to have in your pocket when required. Autumn League presentation on Sat. 22nd. at 5pm in the Club Lounge. Autumn League; The 9Hole League is now in progress for both Ladies and Gents. There were some delays due to the uncertain weather, but all are encouraged to complete Round 4 to 18th. Dec. and look forward the Xmas presentations and prizes. Men’s AGM; The Men’s AGM was held on 3rd. Dec. there was a great turn out, which included the President of the Golf Union of Ireland Mr. John Moloughney. The outgoing President Mr. Phillip Ryan started the proceedings with his address. 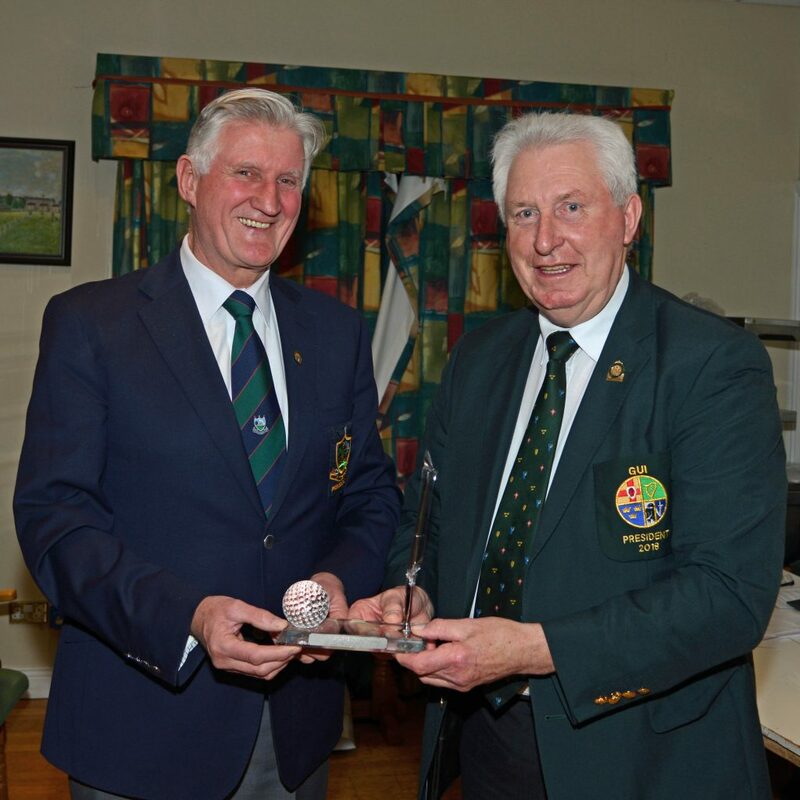 Phil expressed his thanks to 2017 President Tony O’Toole for his nomination to what was a fantastic successful year of golf for Templemore Golf Club, way beyond his expectations at the outset. He thanked his family for their support who made it possible for him to take up this great honor. Phil thanked everyone in the club for their support and then nominated his successor as President for 2019, Mr. Michael Keely former Captain 2009 and a great grounded long-term member and one of the great volunteers to the club. The Hon. Secretary Pat O’Connell gave a first-class report on the past AGM and the Year 2018. The Competition Secretary Liam Leahy gave an appreciated report on the great effort of our players and particular to the JB Carr team, which he had the great honor of carrying the Munster Flag and leading his team over the famous “Wooden bridge” at Woodenbridge Golf Course for the National finals, truly the most memorable occasion participated in. The Hon. Treasurer’s report was delivered by Tom McGrath in great due-diligence and complemented everyone for their prudence in making it possible to invest in new machinery and more in the coming year that will improve the course condition and make the course as attractive as possible that will increase new members to join and more people to play golf in Templemore. The outgoing Captain Tommy Foley thanked Martin Bohan his nomination and expressed great gratitude to everyone in the club for all their support over 2018, his family and especially to his wife Patricia and for providing home cooked confectionary at all events, truly, a wonder-women . Tommy gave great credit to all the competitors of the club and expressed, that it’s the competitors that are the foundation of the success of the club and particular to all the JB Carr team and their manager Liam Leahy in their achievement which gave the Club and all its members great motivation boost. Tommy then invited his successor Vice-Captain Tony O’Toole former President 2017 to carry the mantle as Club Captain for 2019. Tony thanked former vise-Captain John Stapleton for his nomination and expressed his best wishes and a speedy recovery to both John and his daughter Amanda. Tony expressed his appreciation to all past officials and especially to Tommy Foley for all his motivation to the club over the year. He also thanked G.U.I. President John Moloughney for his presence and the great numbers attended and how proud and privileged his is to be selected as Captain of Templemore Golf Club considering for almost 50 years all the people who carved out this fantastic Golf course that we have here today as a testament to their hard work and now our legacy to continue the mantle for future generations. Tony requested to take this opportunity for a short reflection for those that cannot be here that have passed on or are in health recovery. He mentioned the challenges ahead with the introduction of “Golf Ireland” and the new rules of golf. He also expressed to all members that “This is your Club” Promote and Protect your club in what-ever way you can with the focus on increasing membership. Tony expressed that he will passionately represent the club to the best of his ability and will be an open door to everyone. 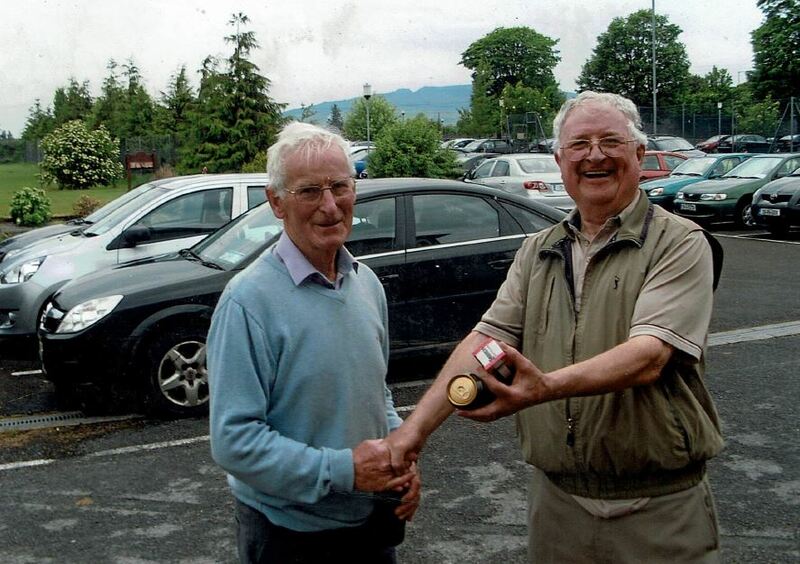 Tony then nominated his successor for vise-Captain, Mr. Dennis Maher, a well-grounded competitive golfer who represented this club on many occasions also managed many a triumphant team. 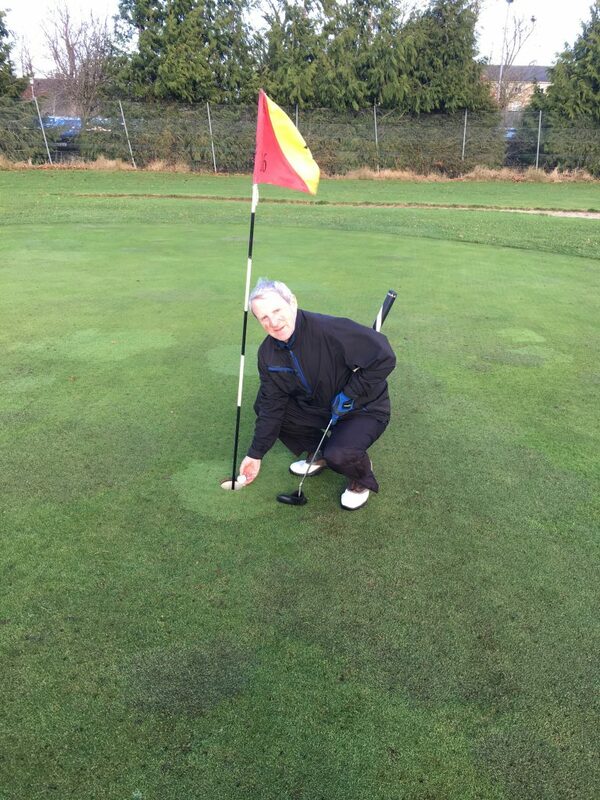 Dennis also has an abundance of Golf Course Management and equipment knowledge and truly is a great asset to the club and will make a great Captain in 2020. Tony also looks forward to working with the new officers and the fantastic new committee and also with the incoming Lady Captain Loraine Ryan. The new officers and Committee were then elected as follows; President; Michael Keely. Captain; Tony O’Toole. Vise-Captain; Dennis Maher. Hon. Secretary; Pat O’Connell. Hon. Handicap Secretary; Jim Ryan. Competition Secretary; Liam Leahy. Committee; Seamus Bourke, Donal Hayes, Michael Purcell, Phil Ryan, Rody Cawley, Myles McMurrow. The green fees were then adopted to continue as they were in 2018 without any increase to make our fees as competitive and attractive to all sectors of the community. The Seniors; On Thursday 6th. Dec. The scores were higher than last week due to the excellent course condition increases the continued popularity of this great event, The team results were; 1st.Team with 52pts. were; Tom McGrath, Mick Carey, Donal Golden, James Murrey. 2nd.Team with 48pts. were; Seamus Bourke, Pat Costello, Jim Gleeson, Tom Hogan. 3rd. Team with 47pts. John Mullaly, Ambrose Purcell, Pat O’Connell, Frankie Shortt. Continued Best wishes were expressed to Rody Cawley on his recovery. Next Seniors on Thursday 13th. Nov. will be special as follows. Seniors Xmas Party; Dec. 13th. Thursday will be a special Day; In the morning will be the golf as usual at 10am. The AGM will be at 1o’clock followed at 2pm. with Dinner in Murphy’s pub and presentation of all Xmas prizes. A great day in the making. New Members for 2019 Rates; The rates for 2019 will be the same as they were in 2018. New members are now been accepted. All current members are encouraged to introduce at least “ONE NEW MEMBER” Lady or Gent, Junior or Student, Seniors Juveniles and Family, Active Retiree’s or any person interested in taking up the sport. It will be a huge advantage to building the club membership and profile. Registrations Forms for new members are now available on-line on our web site, or at the club house or contact Martin Bohan 087 0509278 or any of the committee members. Also, membership payment options can be made through the Golf Club web site link; http://templemoregolfclub.ie/membership/ All will be welcomed. New Members for 2019 Reminder; New members are now been accepted for 2019. All current members are encouraged to introduce at least “ONE NEW MEMBER” Lady or Gent, Junior or Student, Seniors Juveniles and Family, Active Retiree’s or any person interested in taking up the sport. It will be a huge advantage to building the club membership and profile. Registrations Forms for new members are now available on-line on our web site, or at the club house or contact Martin Bohan 087 0509278 or any of the committee members. Also, membership payment options can be made through the Golf Club web site link; http://templemoregolfclub.ie/membership/ All will be welcomed.